MS SQL Server Best Practices Article suggests as a SQL Server configuration best practice is to format your data, logs, and tempdb file drives with a 64KB allocation unit size. When formatting the partition that will be used for SQL Server data files, it is recommended that you use a 64-KB allocation unit size for data, logs, and tempdb. Be aware however, that using allocation unit sizes greater than 4 KB results in the inability to use NTFS compression on the volume. SQL Server, although it is not recommended that you use this, does support read-only data on compressed volumes. 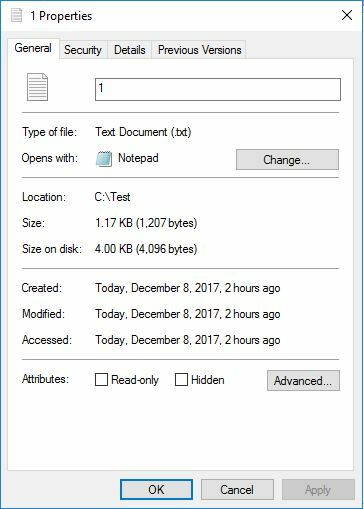 That practically means that no matter how small file you have on the drive formatted with allocation unit size to 64KB that file will take up whole 64KB on disk. You can see that size on disk will be equal to the allocation unit size, no matter if file it is actually smaller than that. Size on disk for the same file will be now equal to 64KB which is the allocation unit size for that drive. 64KB allocation unit size for a drive does not look as best idea if you have lots of really small files but our SQL Server data and log files are much bigger than that. There are really good whitepapers with a recommendation to keep allocation unit size for SQL Server data and log drives at 64KB. 64KB presents one full extent or 8 * 8KB pages in SQL Server. On Windows 2008 and newer versions you can use GUI to format drive (64K allocation unit) and for previous version OS you can use DISKPART to perform partition alignment and assign file allocation unit size. Really Appreciate this post, is there any way I can get an email sent to me every time you make a fresh update? Thanks, I added email subscription option. Thanks for the hint Antonio. FOr Windows Server 2019 there is an option to go further and do 2M AU. Honestly, I would always use storage vendor’s recommended setting. No experience with 2M AU. Sorry, maybe someone else can give you more information. You can see that size on disk will be equal to the allocation unit size, no matter if file it is actually smaller that that. You can see that size on disk will be equal to the allocation unit size, no matter if file it is actually smaller that ( than ) that.